In Gulbarga, all roads lead to Sharana Basaveshwara Gudi. 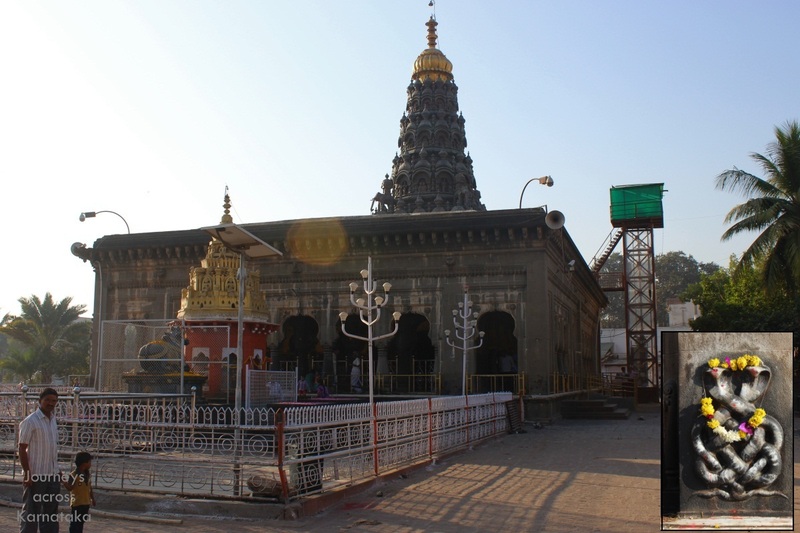 The temple is dedicated to a XVIII Century Lingayath saint, Shri Sharana Basaveshwara is located close to Gulbarga fort. Within the temple is the Samadhi (tomb) of this saint. 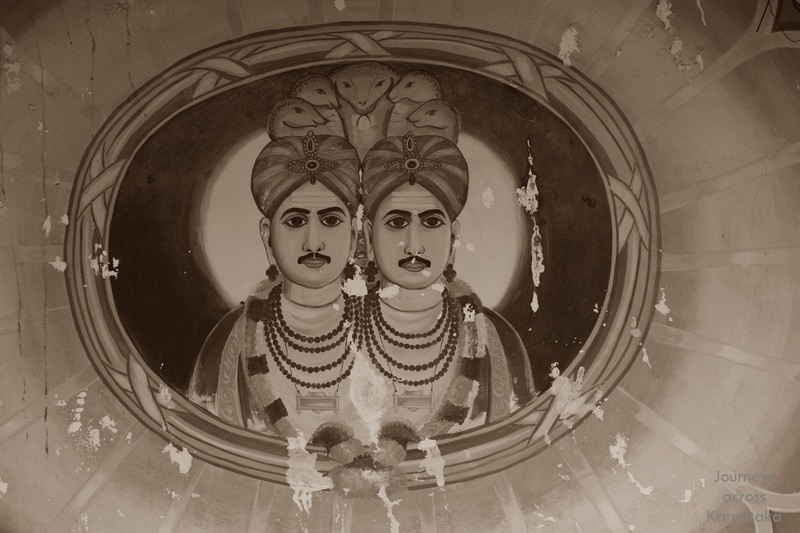 Sharana Basaveshwara was known for his preachings and charitable work. He preached & practised Dasoha (giving is earning) and Kayaka (You have the right to perform the work assigned to you. You have no rights to 'demand' the fruits of your labour" philosophy). 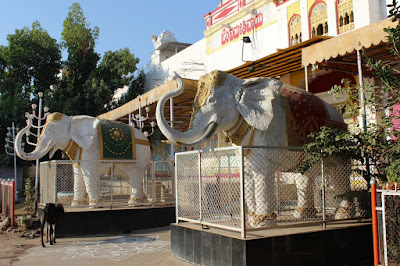 The temple attracts hundreds of visitors daily and during the temple's annual fair- Sharana Basaveshwara Jaatre -tens of thousands of people congregate here for the event. The fair marks the death anniversary of Sharanabasaveshwara. A cattle fair is also held here every year. It is said that Sharana Basaweshwara's parents Malakappa and Sangamma were the guides to the path he chose - to serve mankind. 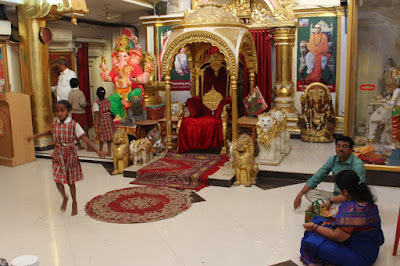 After his passing away, a sacred shrine was built memory of his contribution to the society. Sharana Basaweshwara Mahadasoha Peetha was established later. The Peetha spreads education through their Sharana Basaveshwara Vidya Varshak Samsthe institute. This is my second visit here, the first was exactly 5 years ago. Back then the temple was under repair, the fabricated metallic tower wasn't there. The temple is said to be built around 200 years ago. The architecture is unique to temples of north Karnataka. The column and arches design and the grey stone are typical to some temples. The scultures on this temple are of high quality. One of them is a pair of entangled serpents (see inset in picture above). Here's an artist's depiction of Shri Sharana Basaveshwara. 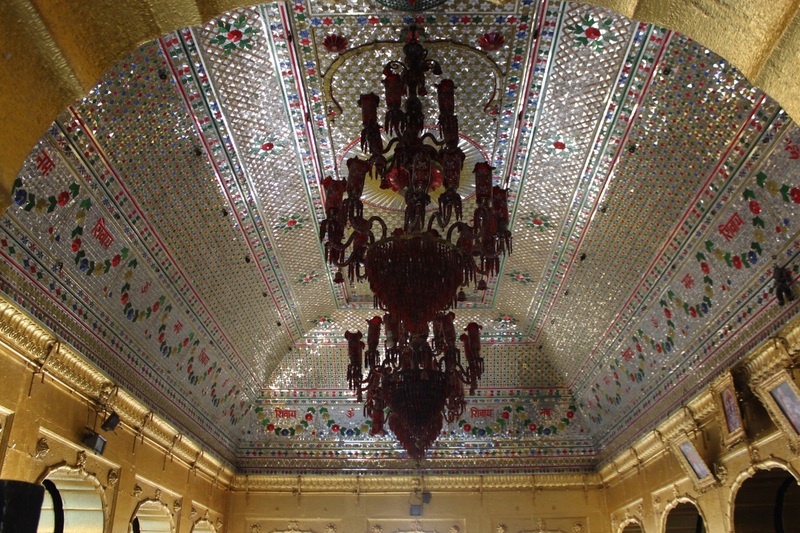 This is the Sabhamantapa ~ meeting hall. 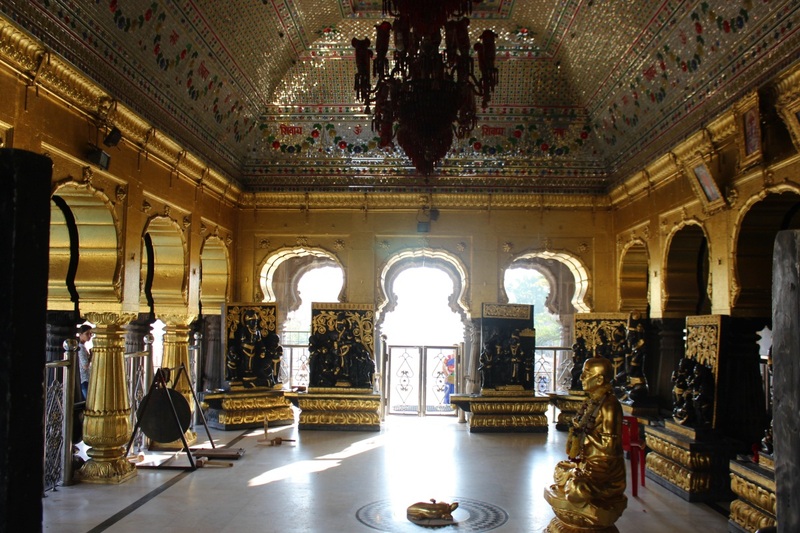 The temple's interior is richly decorated with gold paint, chandlers and glass mirrors.. like a palace. 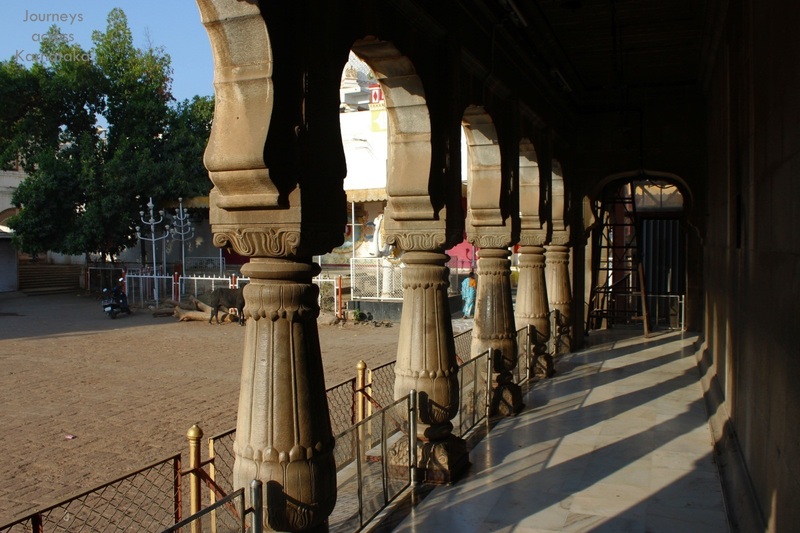 Adjoining this hall is the Garbhagudi ~ sanctum sanctorum where Saint Sharana Basaveshwara's tomb is located. The glass mirror ceiling and stained glass chandler.. typical Nizami taste. 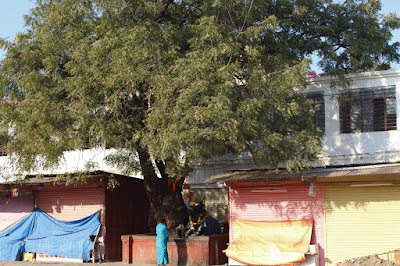 A Neem tree shrine within the temple premises. The temple is surrounded by buildings... the temple & Peetha offices, primary and high schools and pre-university college. The office entrance.. a pair of white elephants greet visitors. The Peetha has a collection of items, some antique too. 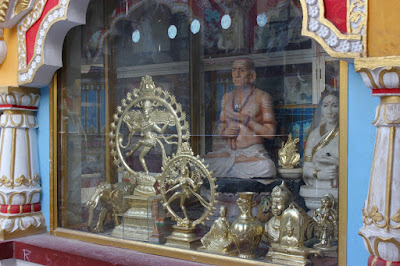 Items included Hindu gods' idols, bells, an electrical clock and a bunch of paintings. Inside is a throne like seat, probably this is Peetha head's official seat. The interior decoration is pretty grand.. gold and red. 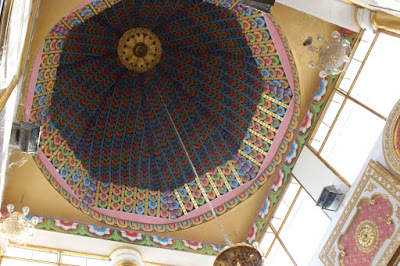 Above this hall is richly decorated dome. The painting style some how reminds me of wall paintings at Mundgod monastery. Each has its uniqueness but something connects them. A marble Nandi adorns the hall's center. 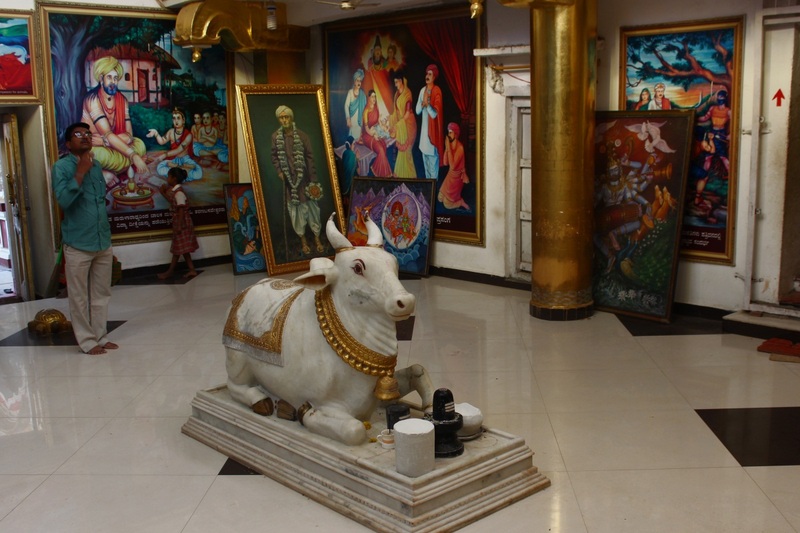 In the hall are several oil on canvas paintings.. depicting moments from Peetha's leader's life and artistic depiction of Hindu gods. Here are two beautiful paintings of Lord Shiva. 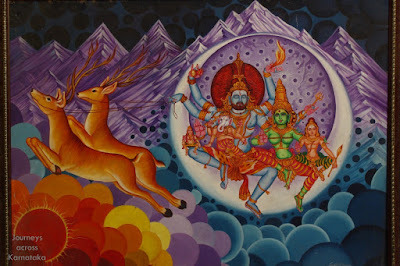 Here's a scene of Shiva, Parvati, Shanmugha and Ganapati seated in crescent moon. A pair of deer are pulling the seated family across the sky over Himalayas. 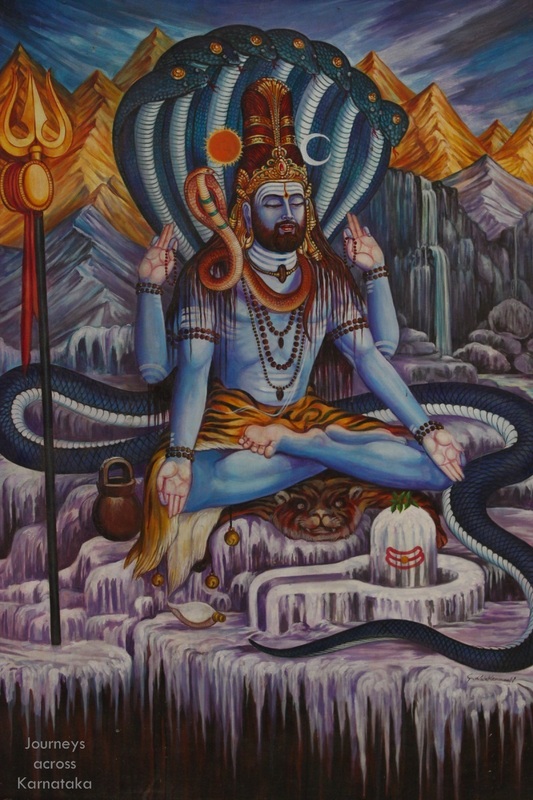 This is another lovely piece of art showing meditating Eshwara sheltered by a seven hooded serpent. 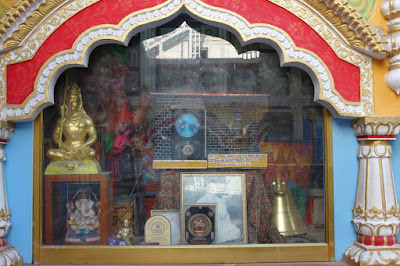 Eshwara's head is flanked by Sun and Moon. In the background are mountains of Himalaya graced by the golden rays of rising Sun.